At least 1711 people were detained, with 998 of them put in pre-trial detention in operations targeting Turkey’s Kurdish minority, and the Gülen group, which the Turkish government accuses of masterminding a coup attempt on July 15, 2016, throughout July, according to data compiled by Turkeypurge.com. The detentions, arrests and dismissals took place between July 1 and July 31. Also, with two new state of emergency decrees issued early on Aug 25, the Turkish government dismissed a total of 922 public servants from public service. On Aug 29, Turkish police detained 23 people in a Corum-based probe on accusations that they use a smart phone application known as ByLock. According to state-run Anadolu agency, arrest warrants were issued for 33 people in eight provinces as part of an investigation into the Gülen group. Turkish authorities believe using ByLock is a sign of being a Gülenist as they see the mobile phone application as the top communication tool within the group. On Aug 28, the Turkish Interior Ministry announced that 400 people have been detained between Aug. 21 and 28 due to their alleged links to the Gülen group. On Aug 28, the wife and one of the sons of former police chief Anadolu Atayun, who has already been under arrest for some 3 years, was detained in Mugla’s coastal district of Fethiye while they were trying to escape to Greece in a boat. The wife was put in pre-trial detention while the son was released pending trial. On Aug 28, Ömer Çatkıç, a former Turkish national football team goalkeeper was arrested as part of an investigation into the Gülen group. Detained on Aug 22, Çatkıç is accused of being a member of the group. Among the evidences for his arrest were his alleged use of the controversial smart phone application known as ByLock and his alleged money deposit into Bank Asya, according to Turkish media. On Aug 26, a Kirklareli man, identified as M.B., was detained while he was visiting his elder brother, Ş.B., who has been under arrest over links to the Gülen group in a prison in the province. On Aug 25, an Izmir man, identified as M.S., was detained for helping the overseas followers of the the Gülen group raise money for post-coup victims in Turkey. Bursa police carried out an investigation to detain M.S. who was suspected of distributing money to the victims of the government crackdown. He was rounded up while withdrawing the money allegedly transferred from Canada-based Gülenists to his account, at a bank branch in Izmir’s Bergama district. On Aug 25, with two new state of emergency decrees issued by the Turkish government, a total of 922 public servants dismissed from public service. The new decrees, published in the Official Gazette, are numbered 693 and 694, are an addition to several others that have led to the purge of more than 146,000 people since a failed coup on July 15. According to the decrees, 142 from Justice Ministry, 29 from Interior Ministry, 19 from Defense Ministry and 120 academics from universities were dismissed from profession. Also, by means of the decrees, 3,000 more convicts will be released immediately on probation unless they were convicted of terrorism, sexual crimes or coup involvement. On Aug. 24, Hayati Güngören, an advisor to Turkey’s only communist mayor Fatih Mehmet Maçoğlu, was put in pretrial arrest on accusations of membership to the outlawed Kurdistan Workers’ Party (PKK) and of aiding and abetting it. On Aug. 24, Ayşegül Çağatay, Ebru Timtik, Didem Ünsal and Naim Eminoğlu, lawyers representing two imprisoned hunger strikers, Nuriye Gülmen and Semih Özakça, were detained as they went to apply to a state of emergency (OHAL) commission on behalf of their clients. According to the Birgün Daily, police detained the lawyers, who were calling for a press release to demand the return of the teachers to their jobs after applying to the OHAL commission on behalf of Gülmen and Özakça, who have been on a hunger strike for 175 days protesting their dismissal under state decrees. On Aug. 24, a 19-year-old university student was arrested by an Edirne court for “insulting” Turkish President Recep Tayyip Erdoğan on social media, the Diken news portal reported. According to the report, police raided the home of M.S.Y. in the Keşan district of Edirne and detained the suspect on charges of insulting a public servant. M.S.Y. was later arrested by a court and sent to jail. On Aug. 24, a man with a tattoo on his arm reading “Peace in the country council” was detained in Kayseri on charges of “terrorist propaganda” and insulting state authorities, CNN Türk reported. Kaan Ayhan, a man working in a package store, was detained on charges of disseminating terror propaganda on behalf of the Gülen movement and insulting Turkish President Tayyip Erdoğan and the government of the Turkish Republic on his social media account, as part of an investigation by the Kayseri Chief Public Prosecutor’s Office. On Aug. 24, a Turkish court charged American pastor Andrew Brunson, who was jailed in Turkey in October due to alleged links to the Gülen group, with acquiring secret political and military information, attempting to destroy constitutional order and overthrow the Turkish Parliament. According to Hürriyet daily, İzmir 2nd Penal Court of Peace ruled for the arrest of Brunson who was already arrested by a different court over links to the Gülen group. On Aug. 24, Berkan Sönmezay, district governor of Söğüt in Bilecik province, was detained on Thursday over his alleged use of ByLock, a smart phone application that Turkish authorities believe was widely used as a communication tool among followers of the Gülen group. On Aug. 23, Turkeypurge.com reported that Muharrem Sağlar, a Bingöl-based former teacher who was retired after he survived colon cancer, has been under arrest for more than 5 months and his daughter, a 100 hundred disabled girl shows anxiety as she misses her father. On Aug. 23, at least 20 people including small business owners and former public workers who were earlier dismissed from their jobs over links to the Gülen group were detained in Manisa province. On Aug. 23, five out of 12 Peoples’ Democratic Party (HDP) members in the southwestern province of Antalya were arrested, the Sendika.org news portal reported. The HDP members were previously detained following simultaneous raids in their residences as part of an investigation conducted by the Antalya Chief Public Prosecutor’s Office against the Kurdistan Workers’ Party (PKK) and the Kurdistan Communities Union (KCK). The detainees — Hogır Gürses, Murat Altundağ, Sevin Ağaoğlu, Tarık Altay, Aydın Benek, Azat Benek, Ferhat Keser, Vedat Güneş, Mehmet Bilen, Bilal Temiz, Emre Alpar, Serhat Keser — were referred to court on Wednesday where 5 of them were subsequently arrested while the remaining 7 were released pending trail. On Aug. 23, Turkish police teams detained Lt. Zabit Zengin, gendarmerie commander in the Maçka district of northeastern Trabzon province, as part of an İzmir-based investigation into the Gülen group. According to the Habertürk daily, Zengin was taken into custody by the counterterrorism unit of the Trabzon Police Department. On Aug. 22, Diyarbakir police detained Amedspor player Deniz Naki due to the social media posts that allegedly “insult” Turkish President Recep Tayyip Erdogan. Following a police interrogation, the footballer was released once authorities concluded that the implicated Twitter account is not used by Naki but a fan group. On Aug. 22, ten teachers were detained in Turkey’s Malatya province as part of an investigation into the followers of the Gülen group. On Aug. 22, Supreme Court member Mustafa Erdoğan died in critical care shorty after he was released from police detention. On Aug. 21, Ahmet Şan, the chairman of Atiker Konyaspor, the main team from Turkey’s central Anatolian province of Konya was briefly detained as part of an investigation into the Gülen group. On Aug. 21, Turkish police detained Elif Açıkgöz hours after she gave birth Adana Avrupa Hospital, over her alleged links to the Gülen group. After they were told that Açıkgöz could not be discharged from the hospital, police started a vigil in front of her room, and eventually taken her into custody. On Aug. 21, Detention warrants were issued to detain 119 people who used to work at the private schools that the government shuttered over links to the Gülen group in Ankara. On Aug 21, the Turkish Interior Ministry announced that 616 people had been detained between Aug. 14 and Aug. 21 due to their alleged links to the Gülen group. The ministry also said seven people were detained on charges of disseminating terrorist propaganda on social media after investigations were launched into 682 social media users and the identities of 255 were confirmed. The posts allegedly disseminated terrorist propaganda and praised terrorist organizations as well as provoking people to hatred, revenge and enmity and insulting state authorities. On Aug 19, Police detained Feyza Yazıcı one day after she gave birth to a premature baby, as part of the Turkish government’s witch-hunt against the Gülenists. On Aug 18, addressing students being sent abroad with a scholarship, President Recep Tayyip Erdoğan’s son-in-law and Energy and Natural Resources Minister Berat Albayrak said he would strangle supports of the Gülen group wherever he sees them. “You probably see them in the countries you are visiting. By God’s name, I could barely hold myself if I were you. I would strangle them wherever I see them,” he said. On Aug 18, pro-Kurdish Diha news agency reporter Mehmet Siddik Damar was put in pretrial detention over his social media posts. On Aug 18, 17-year-old Yasemin Atayün, the daughter of imprisoned police chief Anadolu Atayün, was handcuffed and detained by police. On Aug 18, Zeliha Esra Karayeğen, the 23-year-old daughter of jailed journalist Ibrahim Karayegen was put in pretrial arrest on charge of membership to a terrorist organization. A former managing editor at the government-closed Zaman newspaper, Karayeğen was reportedly detained at Istanbul Atatürk airport while he was fleeing Turkey’s post-coup crackdown on dissident voices that put more than 270 journalists behind bars. According to journalist Harun Odabaşı, Karayeğen’s daughter Zeliha Esra was also detained and sent to jail on charges of membership to the Gülen group. On Aug 18, a Konya businessman, identified as M.T., was rounded up by police at Konya airport, on his way back from Romania. On Aug 18, nine teachers were detained in Turkey’s Malatya province as part of an investigation into the followers of the Gülen group. On Aug 17, a Samsun court put ten Beşiktaş sports club fans in pre-trial detention for holding banners that read “Nuriye Semih Shall Live” in support of two jailed educators who are on the 162nd day of a hunger strike. The fans whose houses were raided by Turkish police, were arrested on charges of propagandizing for a terrorist organization, while one supporter was released on judicial probation. The Samsun Chief Prosecutor’s Office released a written statement which that said warrants were issued for suspects who held banners supporting the Revolutionary People’s Liberation Party/Front DHKP-C armed terrorist organization and its militants. On Aug 17, the Ankara Public Prosecutor’s Office issued detention warrants for 70 Finance Ministry staff members over the use of a smart phone application known as ByLock. In a similar vein, Turkish police detained 20 people in a Konya-based probe on accusations that they use the same smart phone application. On Aug 17, a Turkish court officially arrested nine more Turkish journalists for using ByLock. On Aug 16, a 58-year-old prospective Hajj pilgrim was detained on coup charges at İzmir’s Adnan Menderes Airport. According to a Twitter account named Kaç Saat Oldu? a woman identified as Hanife Işılak was taken into custody while she was waiting to get on a flight to Jeddah, on her way to the holy Muslim city of Makkah in Saudi Arabia. The suspect was reportedly detained as part of an investigation into the Gülen group. On Aug 14, the Turkish Interior Ministry announced that a total of 267 people were detained between Aug. 13 and Aug.7. On Aug 12, Turkish police broke the arm of Gülsüm Elvan, the mother of Berkin Elvan, who was killed during the Gezi Park protests in 2013, while detaining her during a protest in İstanbul’s Kadıköy district in support of imprisoned educators Nuriye Gülmen and Semih Özakça, who have been on a hunger strike for over 150 days. Gülsüm Elvan’s arm was broken by a police officer when she was handcuffed with her hands behind her back. She was taken to a hospital for treatment. Berkin Elvan, a 15-year-old Turkish teenager, died in 2014 after being in a coma for 269 days induced when he was hit in the head by a tear gas canister fired by police during the Gezi Park protests in İstanbul in the summer of 2013. On Aug 12, Turkish police detained 23 people, including the Antalya co-chairs of the pro-Kurdish Peoples’ Democratic Party (HDP), in operations against Kurdistan Workers’ Party (PKK) militants in five provinces, CNN Türk reported. According to the report, Antalya anti-terror branch teams carried out an operation in Antalya, İstanbul, Kayseri, Diyarbakır and Bursa and detained 23 suspects, including Antalya HDP Co-chairs Songül Şarklı and İhsan Nergis and two lawyers. On Aug 12, Berivan Alta, a reporter from the pro-Kurdish news portal Dihaber, was briefly detained due to an outstanding arrest warrant, the Cumhuriyet daily reported. According to the report, Altan was detained during a security check in Mersin’s Mezitli district due to an outstanding arrest warrant and was taken to the Tece Police Station. On Aug 12, Ayşe Bulut Yanılma, a female teacher who used to work at a prep-school affiliated with Turkey’s Gülen group, were arrested by a Turkish court hours after she had a surgery at a Kocaeli hospital. On Aug 12, at least 21 people were detained as part of an investigation into the Gülen group in Zonguldak. Among the detainees were university students, shopkeepers and former public servants. Detainees are accused of using ByLock. On Aug 11, eight more companies in Turkey’s Kahramanmaraş province were seized by the government as part of an investigation into the Gülen group. On Aug 10, a 70-year-old prospective Hajj pilgrim was detained on coup charges at İstanbul’s Atatürk. According to the TR724 news portal, Kıymet G. was taken into custody while she was waiting to get on a Turkish Airlines flight for the Muslim holy city of Mecca in Saudi Arabia. On Aug 10, Mülkiye Demir Kılınç, a 32-year-old mother of twin babies was put under arrest after the Supreme Court of Appeals upheld her conviction on terror charges. On Aug 9, three people were detained in Tekirdağ’s Çorlu district on charges of insulting President Recep Tayyip Erdoğan on social media. On Aug 9, dismissed from their government jobs under a post-coup emergency decree, 12 teachers were detained at two apartments in Manisa province where they were teaching students for university and high school examinations. Manisa police carried out operations at 10 locations, among them are two apartments that were used as teaching centers. On Aug 8, at least 18 people were detained by Turkish police over alleged use of a smart phone application known as ByLock, the Hürriyet daily reported. According to the report, as part of an investigation by the Elazığ Public Prosecutor’s Office, police carried out operations in Elazığ, İstanbul, Ankara, İzmir, Kocaeli, Hatay, Denizli and Malatya provinces. On Aug. 7, a total of 448 people were detained across Turkey as part of investigations into the Gülen group between July 31 and August 7. On Aug. 6, an Ankara prosecutor issued detention warrants for 50 former and nine current Science, Industry and Technology Ministry staff members over use of a smart phone application known as ByLock, Turkey’s state-run Anadolu news agency reported. On Aug. 6, Aliye Şenoğlu, a public official working at Adana’s Seyhan municipality and a member of opposition Republican People’s Party (CHP) was put in pre-trial detention for criticizing a series of events held by the Turkish government to celebrate the first anniversary of the defeat of last year’s failed coup attempt. On the first anniversary of a failed coup attempt on July 15, 2016, Ankara declared July 15 an annual national holiday of “democracy and unity”, billing the foiling of the putsch as a historic victory of Turkish democracy. “The dogs that want to celebrate July 15! July 15 is a black day for Turkey. It is the day on which two religious mafias murdered 20-year old soldiers who know nothing “about the attempt. Curse be upon those who tortured my soldiers on that day,” Şenoğlu said. She also posted several photos showing soldiers being attacked by tens of civilians upon their surrender on the bridge. On Aug. 5, I.K., a former deputy police chief in Gaziantep’s Sehitkamil district who was dismissed in the government’s post-coup crackdown, was detained when he visited a local State of Emergency (OHAL) commission in Sivas to reclaim his rights. The government earlier established OHAL commissions across the country in order to investigate applications directly related to the loss of state jobs through post-coup emergency decrees. Meanwhile, human rights defenders say that commissions were set up only to avoid possible penalties from the European Court of Human Rights (EctHR). State-run Anadolu agency reported that I.K. was subjected to criminal record check at the entrance of the commission’s office even before he managed to submit his application. On Aug. 5, at least 30 people including teachers, businessmen, and public servants in Tekirdağ province were detained over their alleged use of ByLock mobile app. On Aug. 4, Gülşah Erol, a Turkish cellist was reportedly locked in room and beaten by police who accused her of being “a terrorist and carrying a bomb in her cello,” the Sol news portal reported. According to the report, Erol was detained at the Kadıköy metro station and two police officers hit her in the face with a Turkish flag while threatening her with jail time. “I was handcuffed and punched tons of times. When I pleaded for them to be careful with my arms and hands as I am a musician, they beat me even more. They said that people like me should leave the country as they were all terrorists. Almost all parts of my body hurt so badly. I could die yesterday,” Erol said. On Aug. 4, detention warrants were issued for 50 former and nine on duty Science, Industry and Technology Ministry staff members over the use of a smart phone application known as ByLock, Turkey’s state-run Anadolu news agency reported. On Aug. 3, two out of four local journalists in Turkey’s Gaziantep province who were earlier detained for releasing an interview with jailed businessman Ahmet Selim Ener, were put in pre-trial arrest. Ener was previously imprisoned over alleged links to the Gülen group. On Aug. 2, a Şırnak court arrested French journalist Loup Bureau on charges of aiding and supporting a terrorist organization, pro-Kurdish Dihaber reported. According to the report, Bureau was on his way to the Kurdish region of northern Iraq through the Habur border gate after visiting Şırnak province when Turkish police detained him. The court ruled for the arrest of Bureau on for “aiding and supporting a terrorist organization.” He was taken to the Şırnak T-type prison. On Aug. 1, under arrest for nearly 5 months, retired police chief Ahmet Tatar has passed away after a heart attack in Osmaniye prison. Tatar, retired from his position as the head of the Diyarbakır Regional Police’s traffic division in 2015, suffered a heart attack and was taken to a Osmaniye Public Hospital where he later died. On Aug. 1, Sultan Çetintaş, was detained a day later she gave birth to her third child in the Turkish province of İzmir. Çetintaş was reportedly taken to the İzmir courthouse with her one-day-old baby after undergoing a C-section. Sezgin Tanrıkulu, a Turkish deputy from the main opposition Republican People’s Party (CHP) has called on Prime Minister Binali Yıldırım to stop the practice of detaining women hours after giving birth due to their alleged links to the Gülen group. 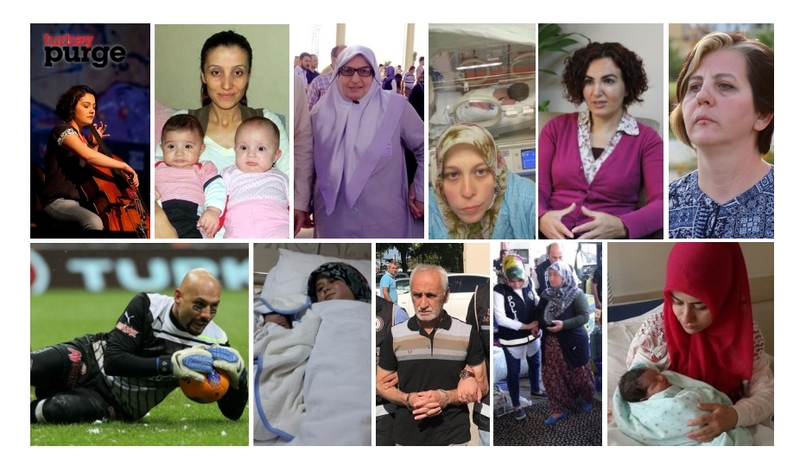 Tanrıkulu posted several photos of women who were detained after giving birth to babies in hospitals in different parts of Turkey and said, “Stop sending police to hospital rooms to detain woman right after their babies are delivered.” “Sultan Çetintaş gave birth yesterday and was detained today, taken to the İzmir courthouse. Stop these inhuman practices,” Tanrıkulu added in another tweet.